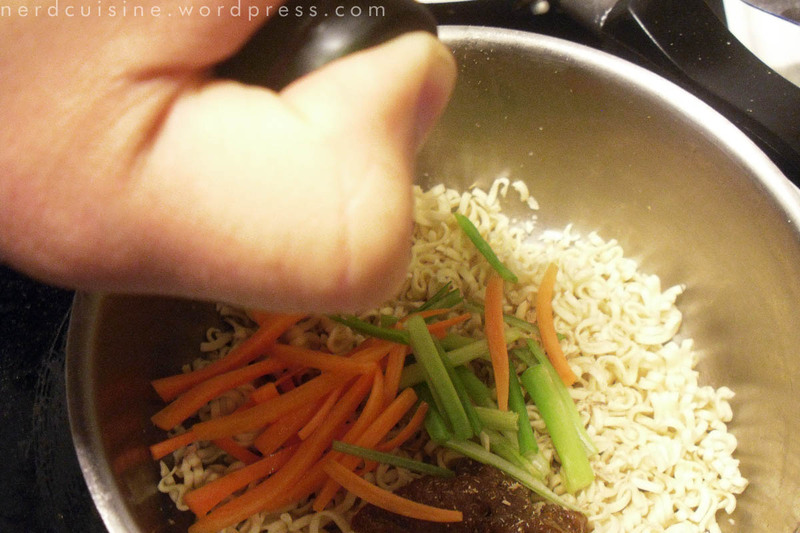 I felt like writing a new post, but can’t for my life figure out what to have for dinner. In the meantime I’ll just show off my portable Chinese cabbage patch. 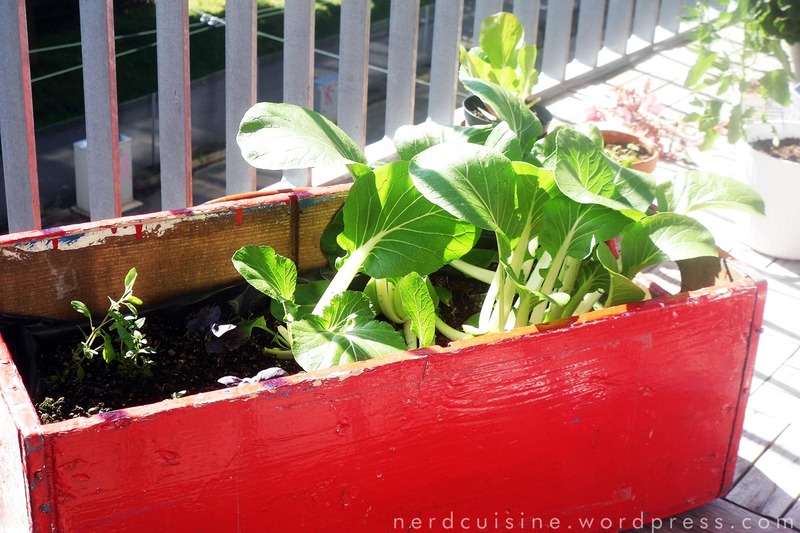 The box also houses red-leaf basil, thyme and lemon balm, which all seem to be late bloomers (intended) compared to the pak choi. 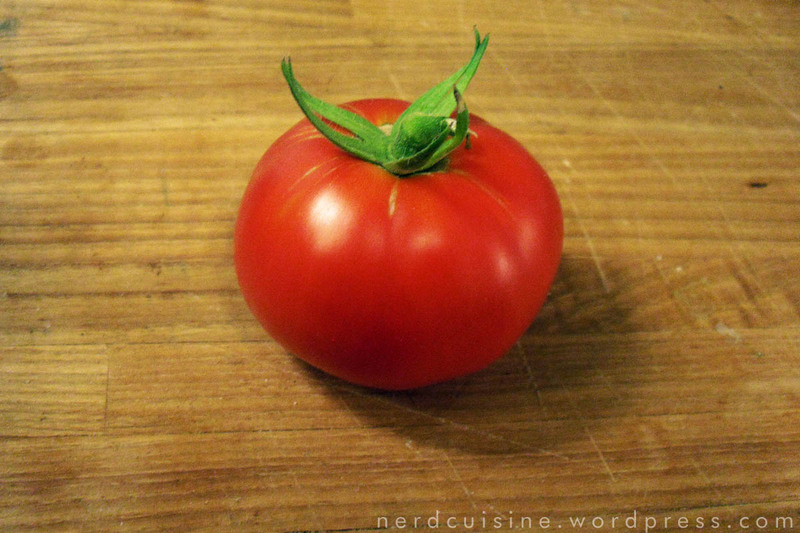 The second homegrown tomato was finally ripe for harvest. In the picture it’s a bit trimmed down, since a dry spell during our trip abroad caused it to split on one side. 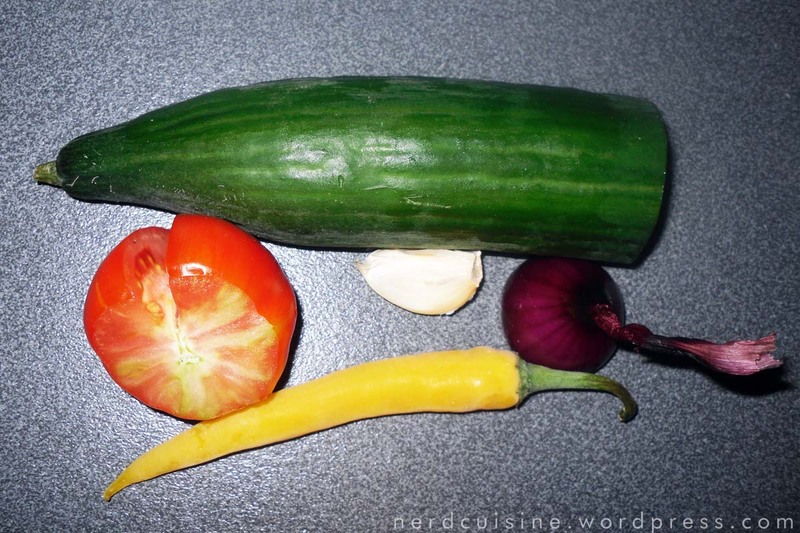 An inventory of the current stock yielded half a cucumber, a frozen chili, a small red onion and garlic, although unless your area is vampire-infested it’s advisable to use less than a whole clove. I also used olive oil, balsamic vinegar, salt, pepper, vegetable stock powder and fresh basil. Typical gazpacho also contains bell peppers, but I didn’t have any, so I chose to pretend a piece of chili pepper was close enough. Cut stuff into manageable pieces and say hello to mr. Blender. After sufficient blending and adjusting of seasoning it was time to plate. I tried two different styles and liked both, so I’m posting both. 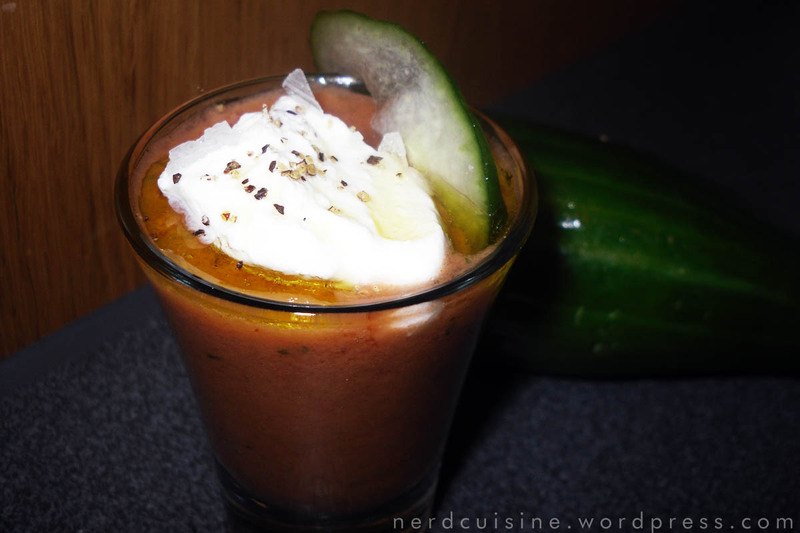 I’ve gotten the feeling that Greek yogurt isn’t among the expected gazpacho garnishes (usually olive oil and croûtons, period) but since it had some heat from the chili, a bit of yogurt wasn’t out of place at all. The red leaf is homegrown basil. 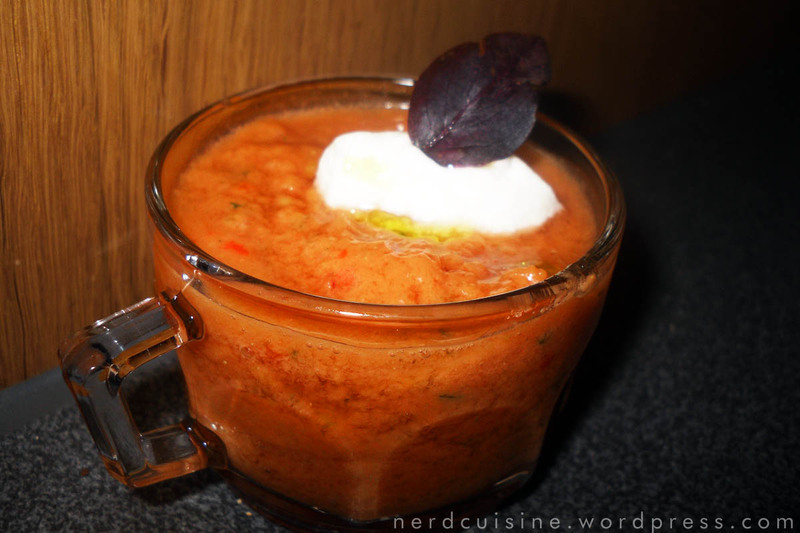 The containers used are a punch cup and a shot glass, to give an idea of the amount of soup teased out of one tomato. My mother entrusted me with a tomato plant a couple of months ago and they’re just the divas of windowsill gardening. A liter of water every day and the water has to be lukewarm and preferably drawn the previous day. It needs a lot of sun, but if not properly acclimatized over several weeks it will wilt or get sunburn if put on the balcony. 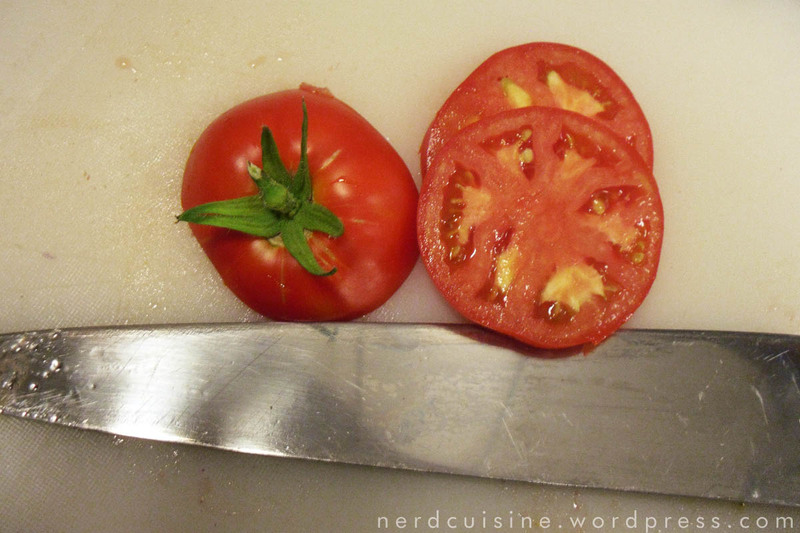 So far the plant has produced two tomatoes, and one of them was ripe enough for picking the other day. It had encountered some kind of problem or disease quite early on and had a large brown spot on the underside which spread into some of the seeds. The upper half looked fine though, so I had a taste but didn’t want to use it in food. Originally, tomatoes were just as fickle as the plants they grow on, with very thin walls and lots of juice, and bruised or broke very easily. Most tomatoes nowadays are therefore much tougher and drier, to withstand industrial handling. This one was meaty to the point of almost being a beef tomato (albeit much smaller) which I happen to like (remember Coeur de Boeuf) and one can only hope that the one still growing, which is just starting to turn a bit orange, will be of similar texture. I don’t have a problem with cooking with only one tomato, since most of my experimental food is done at almost micro scale in order to minimize waste in case things go pear shaped. Since I have a good deal of onions and cucumber at home it’s possible that I’m making half a cup of gazpacho in the near future. 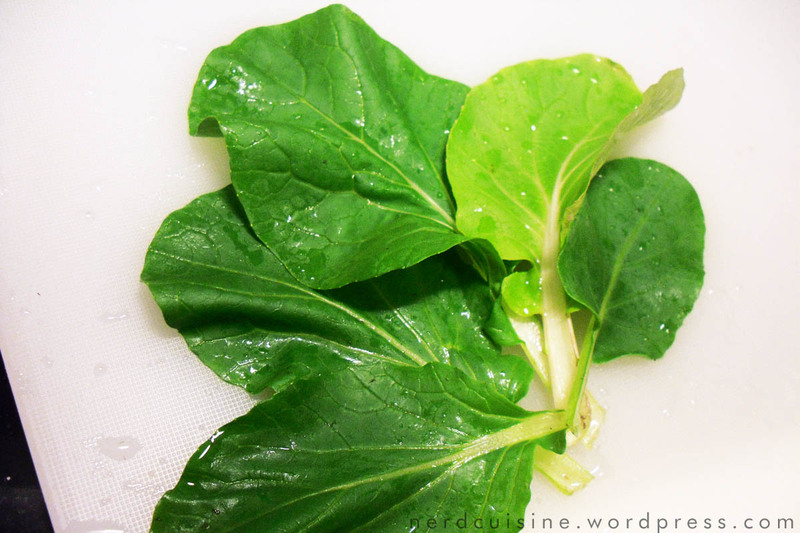 Continuing the harvest theme by actually using the pak choi I proudly showed off the other day. Even though I’ve seen it in Swedish grocery stores on a couple of occasions, it’s a predominantly Asian vegetable, so what better then, than to combine the usage of homegrown cabbage with getting rid of the crumbly bits on the bottom of the ramen bag and the last pack of miso paste? 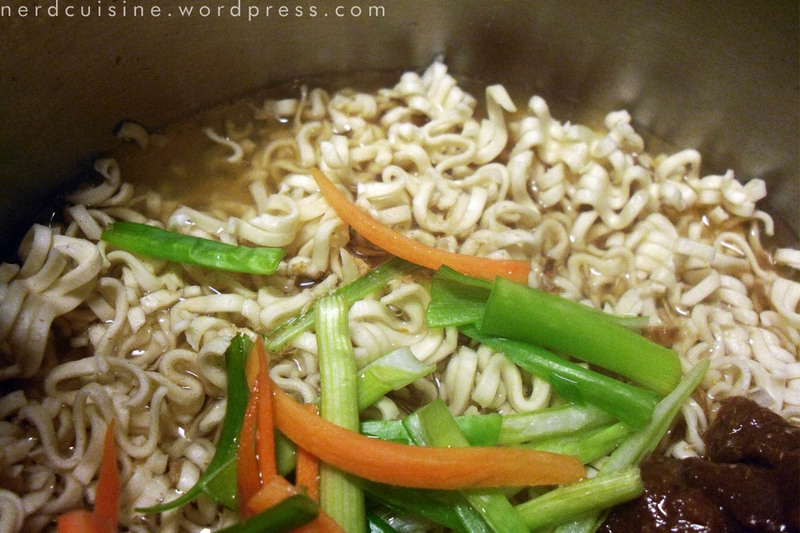 Ramen noodles and miso paste in a pot. 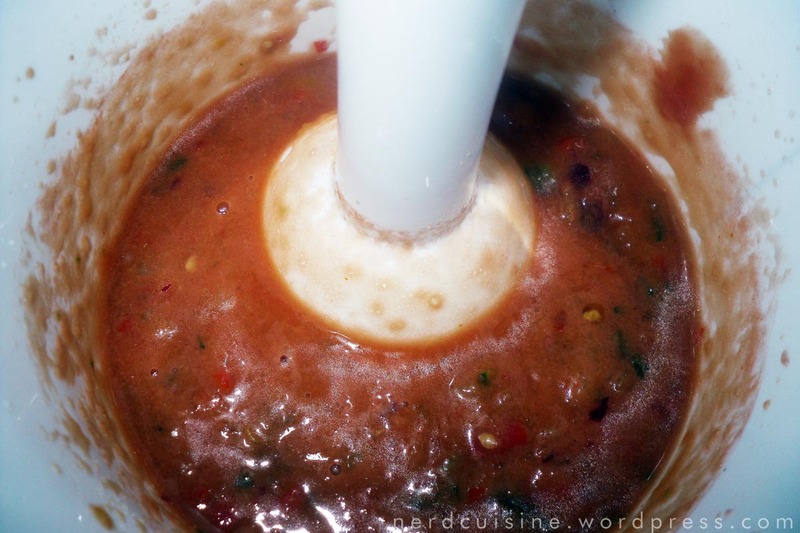 Add a pinch or two of ground up dried mushrooms. Next, a dash of white wine (mirin is probably even better) and a bit of carrots and scallions. Add boiling water and cook for the prescribed amount of time, adding pak choi at the very end to just have it a bit steamed. 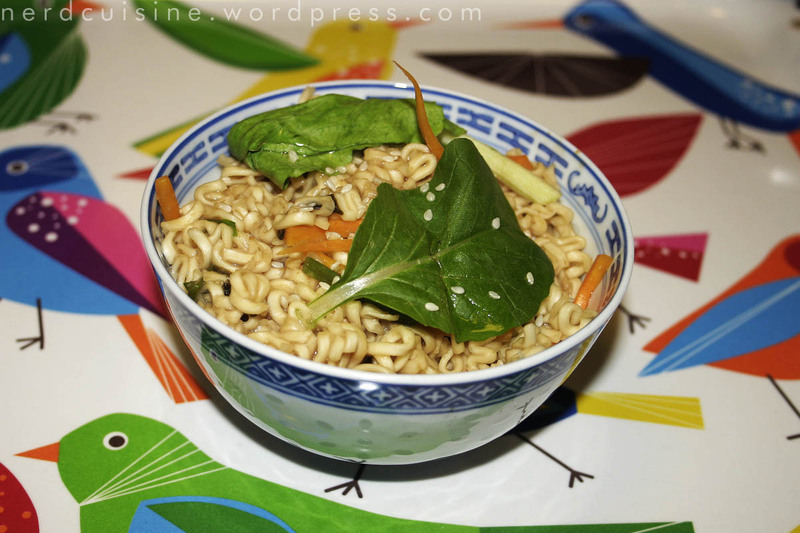 A sprinkle of sesame seeds is perhaps not exactly customary, but quite tasty. Today it’s not about pak choi again, but about basil. Claiming that I’d be using freshly harvested homegrown basil would, however, be a slight lie. The basil wasn’t really harvested – more a matter of thinning out the leaves that looked a bit sad. And I didn’t really grow it; I bought a pot at the grocery store, split the root clump in four and repotted it. I did get it to grow quite a bit though, so it’s not all smoke and mirrors. 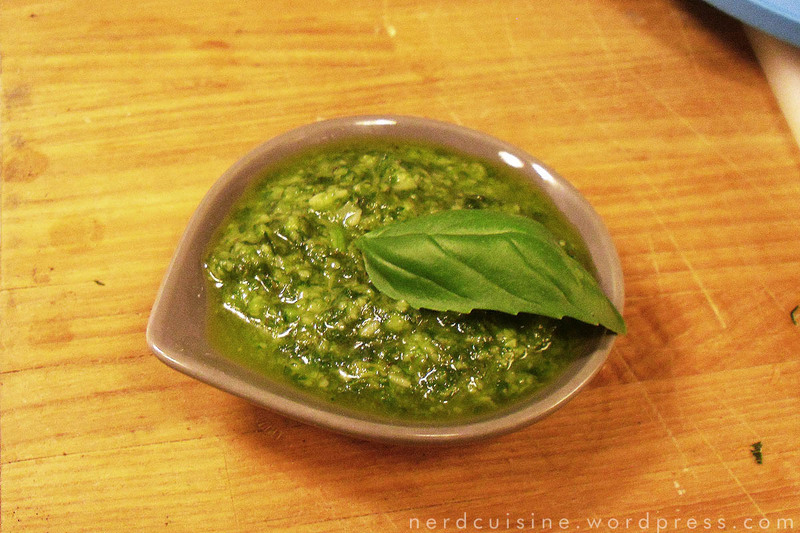 Pistou is what it sounds like – a French pesto (or, more correctly, a pesto from Provence) differing from its Italian counterpart by not containing nuts or seeds and that the cheese is optional. I opted cheese in, since one of the reasons I had for making this was to use up the Grana Padano in the fridge so we can start on the Parmigiano reggiano. 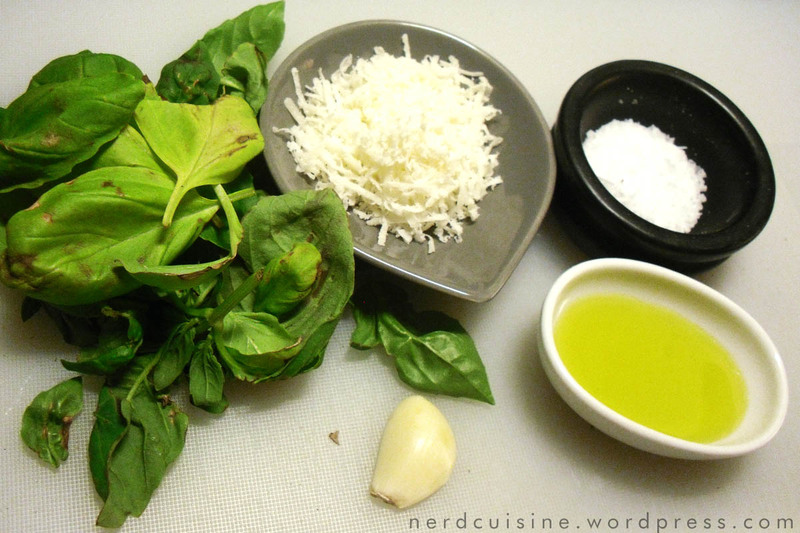 Basil, cheese, garlic, salt, oil. All you need, but more salt and less oil than you will actually need. 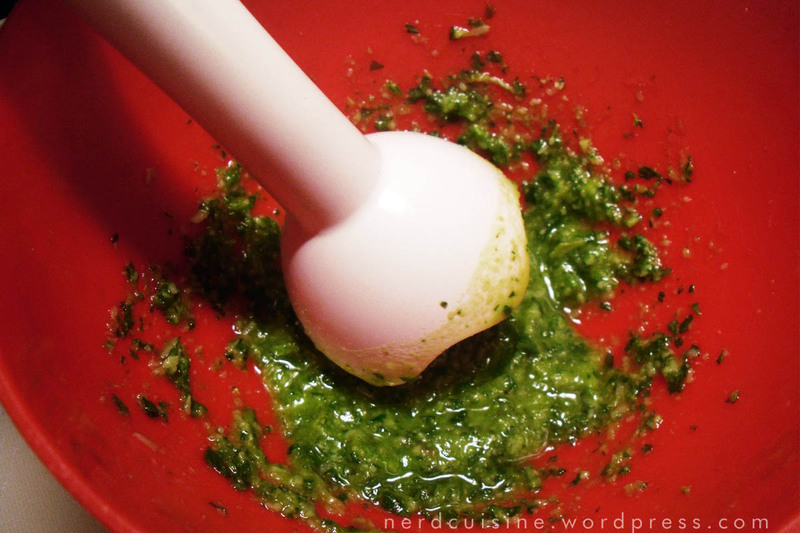 Just as the names pistou and pesto indicate, it’s traditionally made using a mortar and pestle. Sometimes ‘traditional’ only means ‘the hand blender wasn’t yet invented’. 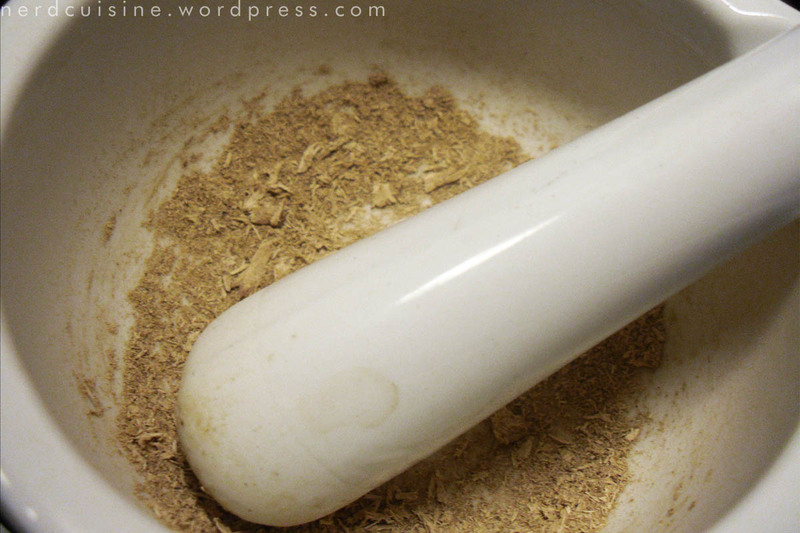 If I was making a larger batch and in possession of a better mortar and pestle, I’d probably think differently. Three minutes or so later, a small bowl of pistou. 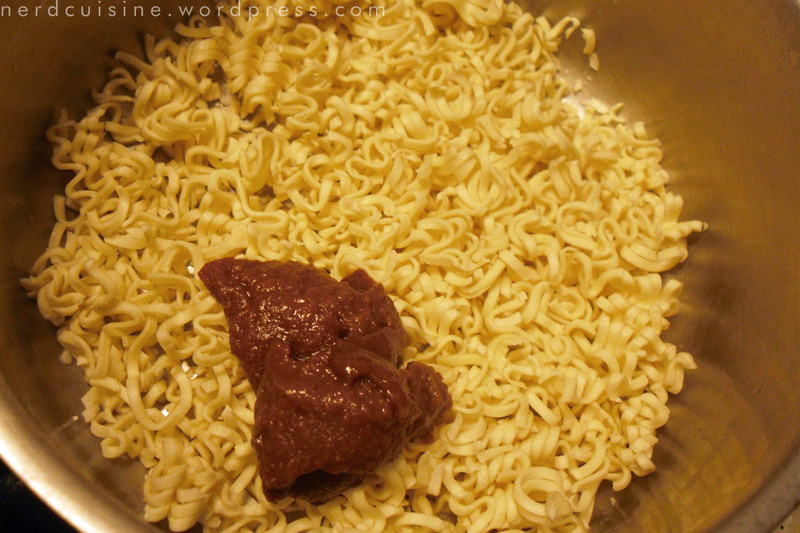 The bowl holds about three tablespoons. In Provence pistou is often served with bread or with vegetable soup. 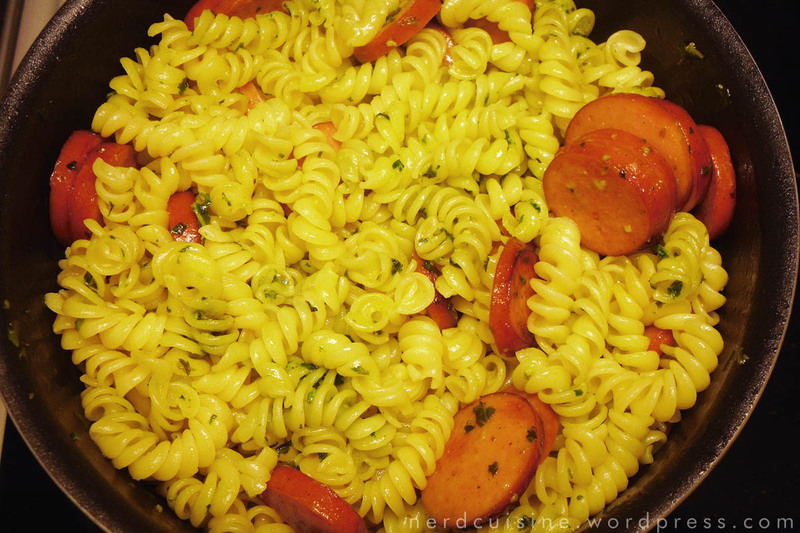 We used it to liven up an otherwise potentially boring dish of pasta and bratwurst. Just wanted to brag a bit about the fact that the pak choi (or bok choy, or chinese cabbage) growing on my balcony has finally reached a size were use in actual food is a real possibility. If I’m to believe the text on the back of the seed packet, I’ll be self sustaining in pak choi until October. We’ve used up all the available pots, so if I’m to expand operations, I will have to do some guerrilla gardening down in the courtyard. I’m sure no one will mind.